If you want to keep up with the things we are thinking about with regard to SB You, visit here often. The team is eager to make this space better for you and here you can see what we are thinking about. As always, please feel free to leave us a comment and tell us what we should be thinking about doing. 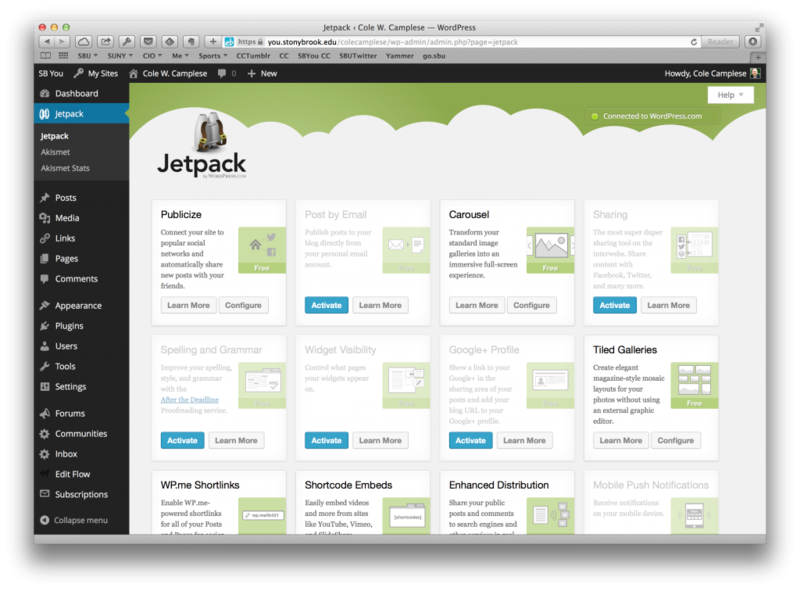 The WordPress Jetpack suite of services is now available on SB You. What that means is that with a single plugin your SB You site can do a whole bunch of new things. The one thing to keep in mind is that once you activate the plugin you have to connect it to a free wordpress.com account. Connecting it to wordpress.com allows you to take advantage of a whole host of new services like better image galleries, better site statistics, and connections to various social media services. 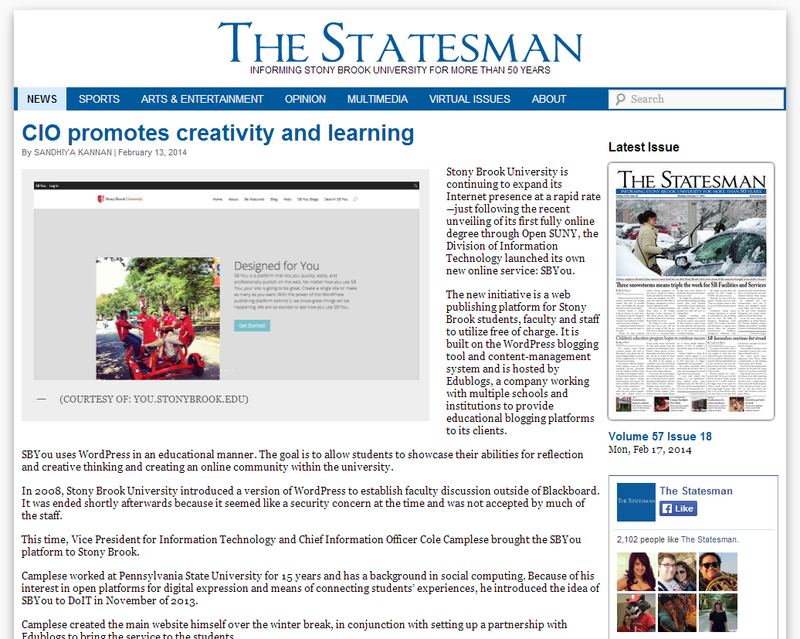 Thank you to The Statesman for helping us promote the SB You service. Click the image to read the full story. After doing some real testing with the CommentPress theme it was determined that it is no longer supported by this version of WordPress. It has been disabled across SB You and we are sorry to have to do that. We are exploring other themes that support similar functionality, but as of today we aren’t prepared to release one. Since Medium has been gaining in popularity we have wanted to provide a theme engine that allows people to comment on a paragraph by paragraph basis. We will get there! Edublogs announced today that they are in the process of improving the stat tracking tools available to all users on Edublogs Campus. As part of this, Edublogs is retiring its old stat tracking service (piwik) and replacing it with Google Analytics. Our CIO Cole Camplese, who is the Super Admin of the SB You platform, made sure our Google Analytics tracking code was set up correctly, so now all users will have a new dashboard widget that shows recent stats, as well as a new menu item under Dashboard > Statistics with even more information. In the coming weeks, Edublogs will be removing the old “Stats” menu item – which if you’ve used it previously, you know it to be a bit slow and difficult to use. Use Google Analytics to keep an eye on traffic and popular content. We should all benefit from these improved stats, reports, and tools. Did you know that content and media files from Edublog, WordPress, and Blogger sites, can be imported into your new SB You blog? Never fear. You can create an SB You blog, import content, and it will not affect your original blog site. The Import and Export features are easy. Here are a few examples. The ePortfolio and Media Consultants in the Teaching and Learning Lab put it to the test and created a WordPress.com blog, Focus on Faculty at Stony Brook. At the same time they created a SB You blog with the same title. Tools, in the Dashboard menu of both sites, has Import and Export features. Using the Export feature in the WordPress.com blog, they created and downloaded an export file onto their computer. WordPress and Edublog provide a simple wizard guide that makes the process easy. The export file was uploaded using the Import feature in our SB You blog. The content was successfully imported and unpackaged. The WordPress.com site remained intact and active (sbueportfolio.wordpress.com). After the import, the content had to be arranged according to the new SB You Magazino theme (you.stonybrook.edu/facultyfocus). I gave it a try and imported content from my ePortfolios inPractice Edublog (eportfoliopractice.edublogs.org)into my new SB You ePortfolios inPractice site (http://you.stonybrook.edu/eportfoliosinpractice). The banner (Header) didn’t import, but all the content and media files uploaded and unpackaged in my SB You site. I only needed to arrange everything to fit the different theme format. My original ePortfolios inPractice blog remained intact. It’s easy and it works! On Jan. 3, 2014, Edublogs announced that it was beginning to upgrade all campus networks (including SB You) to the latest version of WordPress. This upgrade will come with a complete new look to the dashboard experience. Everything remains in the same layout and location, but you will find the look and feel to be more modern and user friendly. The biggest improvement is that the new dashboard is completely mobile, touch, and tablet friendly, meaning it is much easier to write a new post or manage a site from any Web browser on any device – no special app needed! Edublogs is in the process of updating screenshots on its http://help.edublogs.org support site. Let us know if you notice any issues or have any questions by leaving a comment here or on the DoIT Labs blog. SB You is a pilot of the university’s easy-to-use professional website platform. Share your work and explore sites by other faculty, staff, and students throughout Stony Brook University. SB You provides web space for Stony Brook faculty, staff, and students to support professional and educational activities at Stony Brook University. We are in pilot mode at the moment, so come in and give us a test drive. It is easy to get started by logging in with your Stony Brook NetID and we will handle everything else for you. If you want a site, click here and start building! Get your own SB You site now!